I went to visit my Grandma last week. (She is the girl with glasses in the picture above.) She is 90 years old and in a wheelchair since she had a stroke a year and a half ago. That sounds sad, doesn't it? It is sad but at the same time, Grandma is the spunkiest lady I know. She is absolutely determined not to let a little thing like a stroke stop her. Her right side was paralyzed. Grandma is right-handed. In recent years she has taken up poetry writing and oil painting. She still does both, just with her left hand. She painstakingly types out her poems on her tablet, which she has learned to use since her stroke, and sends them to my aunt who prints them out for her. She attends a poetry class at her assisted living facility. Her oil paintings are amazingly good, I would be impressed if she did them with her right hand. The fact that she has not only taught herself how to paint but does it with her non-dominant hand is truly impressive. She also used to be very into photography. She can't manage the controls on a fancier camera but she still takes photographs with her little point-and-shoot camera. Grandma is stubborn and sentimental and opinionated. She loves a good cry over a book, if she hasn't soaked her shirt with tears then the book wasn't good enough. She thinks everyone needs to be married, the sooner the better. Jello salad is the perfect accompaniment to any meal. My grandfather is the man every man is measured against. My son is currently the favorite great-grandson because he is taking manufacturing in school and my grandfather owned a machine shop. Grandma thinks every woman should wear stockings and scolds you if you don't. She scolds the men in the family if they forget to wear their wedding rings. Ice cream is a major food group. She isn't crazy about being in assisted living because she is surrounded by old people. She obviously doesn't really believe she fits into that category. I think I might agree with her. I hope when I am ninety I have half her zest for life and willingness to learn new skills. 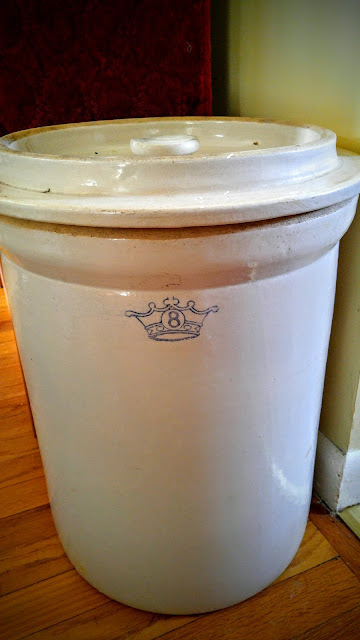 While I was visiting I asked her about some family items she had given me when she had moved out of her condo. I like to know the stories behind them. The quilt was made by my great-great-grandmother about 75 years ago. Grandma remembers coming home and seeing the quilting frame set up in the living room. This was back when quilts really were made out of scraps of fabric and worn out clothes, not brand new material bought from the quilting store. 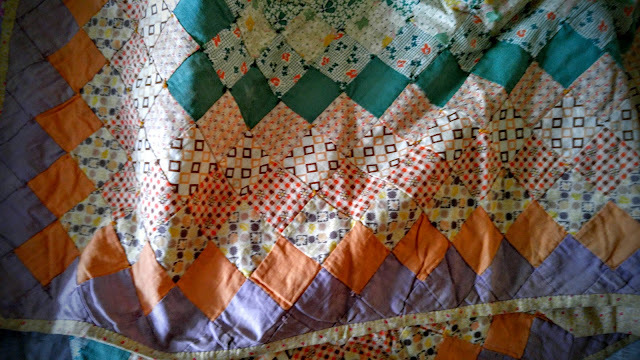 If anyone knows how to care for such an old quilt I would love to know. I am afraid to wash it for fear it might be damaged but I would really like to display it instead of just having it in my linen closet. It is so pretty. This pickle jar belonged to my great-grandfather, except he didn't use it to make pickles. He used it to make alcohol during prohibition. He was German and liked his beer so when prohibition went into affect he had to do something. 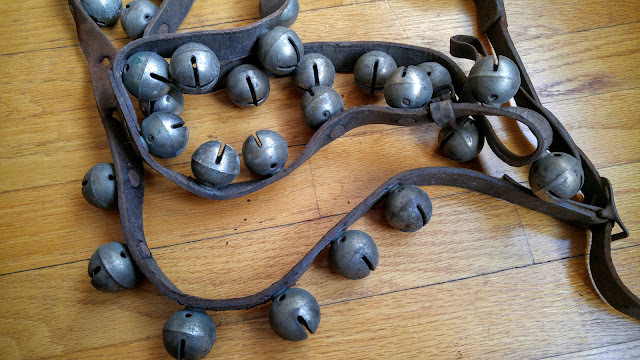 These are the bells off of the sleigh my grandfather had. When he and my grandmother were courting (what a nice old-fashioned word) he would pick her up and take her for sleigh rides. Doesn't that sound like something straight out of These Happy Golden Years? A different era, I know, but still I love the image I have of them all wrapped up and flying through the snow with the sound of the bells ringing around them. It makes going for coffee or to a movie sound so prosaic. These are just a few of the family items I have. 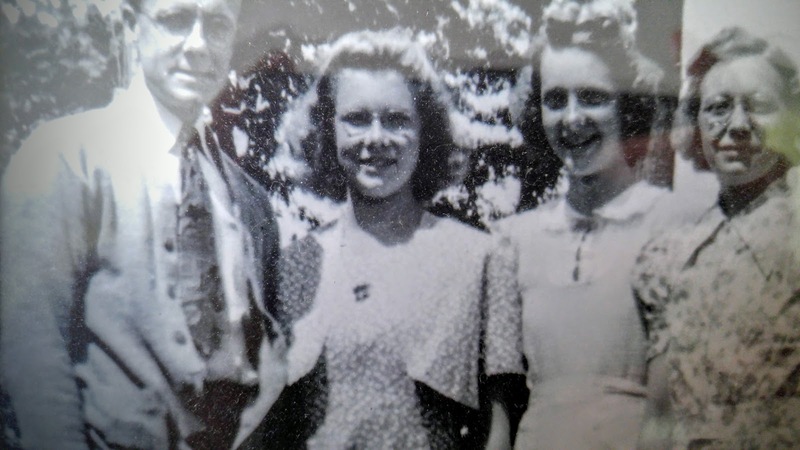 I love the connection to a past and to stories of people and times I never knew. I love the stories of my Grandma, not the old lady sitting in the wheelchair but the girl riding amongst the sound of sleigh bells next to the man she loved. What a lovely post - it made me think of my grandmothers. I have a few things from my mother's mother, including two cut-glass dishes that were part of her wedding set. I don't remember them in her house, but I do love having them. The physical sense of connection means a lot. It's wonderful that you are able to hear the stories around the things as well! Thank you. I know what you mean about the physical sense of connection. I love hearing the bits and pieces my grandmother tells me. It is like reading a few pages out of a book. She is very matter-of-fact about it but I feel like there is a story in there and I want the rest! She sounds like a wonderful person. I'm happy you have her in your life. Beautiful post! I want to be spunky when I'm 90 too. My paternal grandmother was telling jokes and reading books to her grandkids and watching the World Series and feeding birds and squirrels and generally being a spunky person until she was about 93, and then she died about a year later, after having spent only one year acting like an old person. I admire her greatly. Good idea to get stories and info from your grandma about the heirlooms she's passed down! That quilt is gorgeous. Your grandmother sounds wonderful. My goal in life is to be spunky at 90.